I’m 3 years old and I live in Gilbert, Arizona. I like cooking/baking, Disney and playing with other kids. I also enjoy bubbles and going to the park! I think BAND-AIDs can fix all problems and I put them everywhere for everything. When I was 2.5 years old, I was diagnosed with stage 4 neuroblastoma. As a Candlelighters NYC kid, my favorite experiences include going to the children’s museum and getting “princess shoes” for my birthday. My parents say their favorite part of Candlelighters NYC is being able to meet other families and knowing someone is always there to help when you are so far away from home. 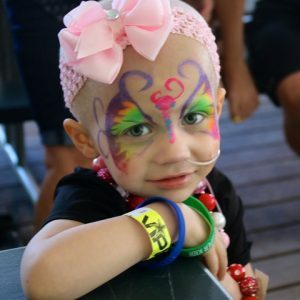 Click here to donate to Candlelighters NYC in honor of Brooklyn.